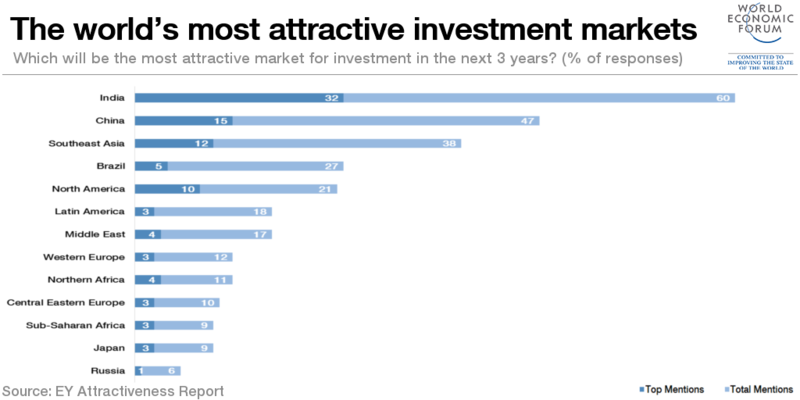 Why is India the most attractive market for investments? With 32% international investors rating India as the best place to do business, the country is the world's most attractive market for investment, according to a report by Ernst & Young. Around 60% investors placed India among the top three investment destinations. This report is a response to the question asked to the international investors "Which will be the most attractive market for investment in the next 3 years?" The investors highlighted improvements in the macroeconomic and political status, FDI policy and ease of doing business which is more attractive this year compared to last year's survey of Ernst & Young. Following India is China in second position where 15% investors rated the country as the best place to do business and 47% said China is among the top three investment destinations. With 12% and 38% rating in the two sectors, Southeast Asia is placed in the third position. Russia and Japan have been voted last in the list with 3% and 1% ratings respectively in ease of doing business. The report by Ernst & Young show that Make in India initiative, Digital India and Smart City Mission has helped India to come this far and has increased optimism in investors' views. India is also seen speeding up the pace to become one of the world's top destinations for manufacturing as well as a a central hub for various operations that will drive economy.